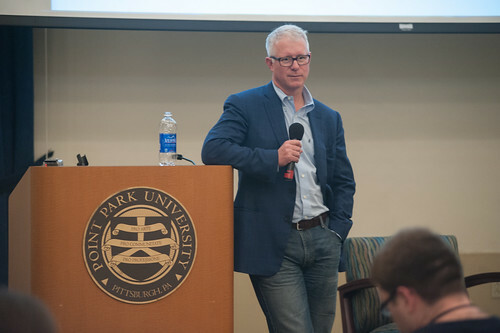 Kevin McClatchy, former owner of the Pittsburgh Pirates and board chair of The McClatchy Company, recently made his first appearance on a college campus, speaking to students at Point Park University this fall. "The sports, arts and entertainment management department was honored to have Kevin McClatchy join us for a discussion on the business of baseball," remarked Steve Tanzilli, J.D., chair of the SAEM department and host of the event. McClatchy spoke to approximately 200 Point Park faculty, staff and students, including many in the crowd who were SAEM majors, about growing up dyslexic and how sports became his passion. "The one thing that neutralized everything was sports. It gave me that comfort zone and confidence," McClatchy explained. He also discussed the highs and lows of being the Pirates owner for 11 years, how building PNC Park was a "labor of love" for him and the strong stigma attached to homosexuality that still exists today in the field of sports. "When I came out publically in the New York Times last year it was like a weight was lifted off of me," said McClatchy. "My hope is that more people in sports come out of the closet. It shouldn't be a big deal." Following his presentation, McClatchy answered questions from the audience for more than a half hour, encouraging students to follow their true passions, make long-term career goals and to have "thick skin" if they plan to work in the sports industry. "I enjoyed learning about Kevin's journey to becoming owner of the Pittsburgh Pirates. The way he got to the Pirates was interesting. Just one phone call changed his life. He also confirmed things I expected about working in the sports industry like long hours and a lot of stress," said freshman SAEM major Jack Mrozinski, whose career goal is to become a general manager for a professional hockey or baseball team. "Kevin did a terrific job outlining the keys to success to our students. In addition, it was great to hear his comments regarding his sexual orientation and how professional sports needs to do a better job of catching up with the rest of society," said Tanzilli. "Events like this are definitely beneficial. We get to see different perspectives from people who currently work or have worked in a field we are trying to get into," commented Jessica Martin, a freshman SAEM major. Martin's career goal is to work in the front office for a sports team or theatre company. "I chose Point Park and its SAEM major because it is the only school in the country to offer all three areas of study - sports, arts and entertainment — in one program," said Martin.